Save $8 on your purchase of 4 tubes of Ulcergard. Rebate form included. Orders Less than 10 tubes will be Voided and Not Shipped. 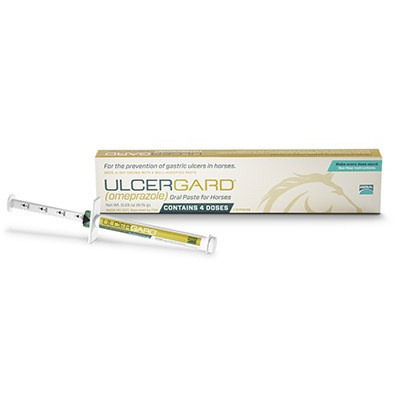 Ulcergard(Merial)Same as RX GastroGard(Merial) is the only product approved by the FDA to prevent equine stomach ulcers. More than 6 out of 10 Performance Horses suffer from Stomach Ulcers. The signs of gastric ulcers in horses, such as weight loss, altered eating behavior and recurrent colic, may often be mistaken for other conditions. UlcerGard (Omeprazole) (2.28 grams/tube) is the main ingredient in UlcerGard, it is an acid pump inhibitor that stops acid production at the source. In extensive Merial testing UlcerGard has proven effective in preventing stomach ulcers in horses exposed to stressful conditions for a duration of 28 days. Administer a minimum of 1/4th of a syringe oral each day for horses 600-1200 lbs, use a minimum of 1/2 tube daily for horses over 1200 lbs. UlcerGard is formulated with a cinnamon flavored base which makes it is easy to use and well accepted by horses. Ulcergard sales are final. Ulcergard is not returnable or refundable.